The three butterflies shown here seem to be very similar. 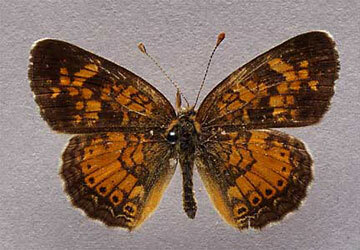 Two of them (the Pearl Crescent and the Northern Crescent) have been considered different forms of a single species, based on appearance and the timing of their flights. However, more recent behavioral studies show that their larvae appear to eat different plants and that the adults tend to select different habitats. (These three specimens came from a site where all have been found occasionally flying simultaneously). Even more recent evidence indicates that these two forms act as separate species in some regions but not others. The specimens shown above are all males. Females show less distinct patterns, but are similar in color and markings to the males. Because butterflies see light in wavelengths different than humans, individual marks and colors may well be more significant to them. Biological views of what constitutes a distinct species has changed with time. Even with the use of DNA, challenges arise that evoke further questions. One example involves two other small Minnesota butterflies. The two, the Melissa Blue and the Karner Blue, appear distinctly different and have been considered separate species, each with its own distribution and habitat. DNA however, has shown them to be identical. This begs the question of whether or not components of the DNA tests are too broad or too narrow in focus. The changing nature of science with its ever-expanding range of tools and techniques will continue to pose new questions. These specimens are the subjects of research soon to be published in Flora and Fauna of Wadena County, Minnesota, Part 1: The Butterflies (Lepidopterae: Hesperoidae and Papilionidae) of Wadena County, Minnesota, by Richard J. Oehlenschlager and Ronald L. Huber, as volume 8, number 1 in the Scientific Publications of the Science Museum of Minnesota, New Series.